Are you headed toward your career? Do you have a plan for student debt repayment? 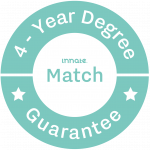 If you are still trying to focus on finishing college, Innate can help. Declaring a final major can be a stressful and confusing process. Innate provides a clear picture of your best options by focusing on what are the best options for the student. We use two inputs: how you’re wired from The Innate Personality Assessment and the Marketplace Career Mapping. This lets us identify specific college majors that will put you on the path to your ideal career. 3. Find the perfect major match. So you can thrive in a major that sets you up for innately matched career path.